They are scheduled to meet Thursday after a report that the overseer of the Mueller probe talked about secretly taping the president. President Donald Trump said Wednesday that he might delay a meeting planned for Thursday with Deputy Attorney General Rod Rosenstein and added he hopes the overseer of special counsel Robert Mueller will be able to continue in his job. Trump declined to answer if he would fire Rosenstein and told reporters the two had discussed whether Rosenstein had reportedly suggested wearing a wire in the presence of Trump and considered seeking to invoke the 25th Amendment, which allows for a president to be removed. "We've had a good talk. He said he never said it, he said he doesn't believe it, he said he has a lot of respect for me and he was very nice, and we'll see," Trump told reporters at a news conference in New York during a meeting of the U.N. General Assembly. "I don't want to do anything that gets in the way of this very important Supreme Court pick, so I don't want it competing and hurting the decision one way or the other." A showdown hearing on Supreme Court nominee Brett Kavanaugh also is scheduled for Thursday before the Senate Judiciary Committee. Trump added, "I would much prefer keeping Rod Rosenstein — many people say I have the right to absolutely fire him." 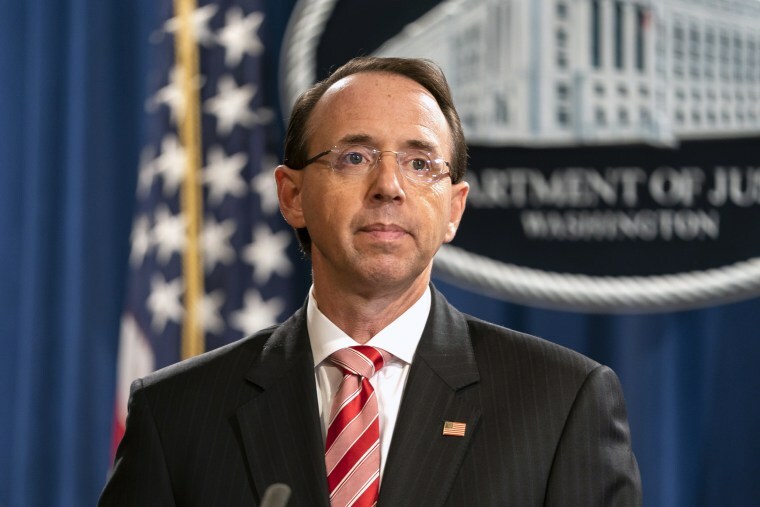 Justice Department officials told NBC News last week that Rosenstein was joking when he discussed wearing a wire to secretly record the president and said that deputy attorney general does not believe Trump should be removed from office.